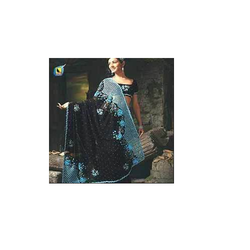 The Embroidery on Sarees offered by us are highly appreciated for their appealing and splendid designs. These traditional and modern embroidery for sarees are designed using a variety of threads, which include silk, gold and zari. Utmost attention is paid to details like styling, weaving, heavy & light work and stitching in order to be able to provide our clients with a flawless range of sarees made by order. We offer to our client's Embroidery for Bridal Sarees. These are provided in beautiful designs and patterns and are crafted by experts. We also provide embroidery on bridal sarees in mirror work, zari work and also stone work and are also available in unique designs. These embroideries give a perfect traditional look. Beautifully printed crepes and georgettes. Dust free easy to organize. We offer Embroidery Work On Sarees in different colors, prints, beads, gemstones, sequins, and embroideries. Our hand embroidery work on sarees is praised due to striking designs and patterns are done by our team of designers. Our range of Embroidery is a mix blend of traditional and contemporary designs on sarees. These are elegant in finish and design and are highly suitable to wear at parties and other occasions. Looking for Embroidery on Sarees ?